NASA has declared that the first human-made item left the limits of our solar system a year ago. It is now wandering outside the heliosphere, or range of our sun’s effect. NASA prepared the declaration on September 12, 2013 that the Voyager 1 spacecraft, launched in 1977 – has now formally arrived interstellar space. NASA also released this video, in which the noises of interstellar space can be heard. In actual fact, the science group used these sounds to help conclude the density of space through which Voyager 1 is now fleeting. 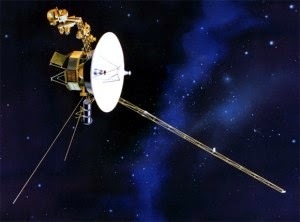 Voyager 1: One for the ages. Via NASA.